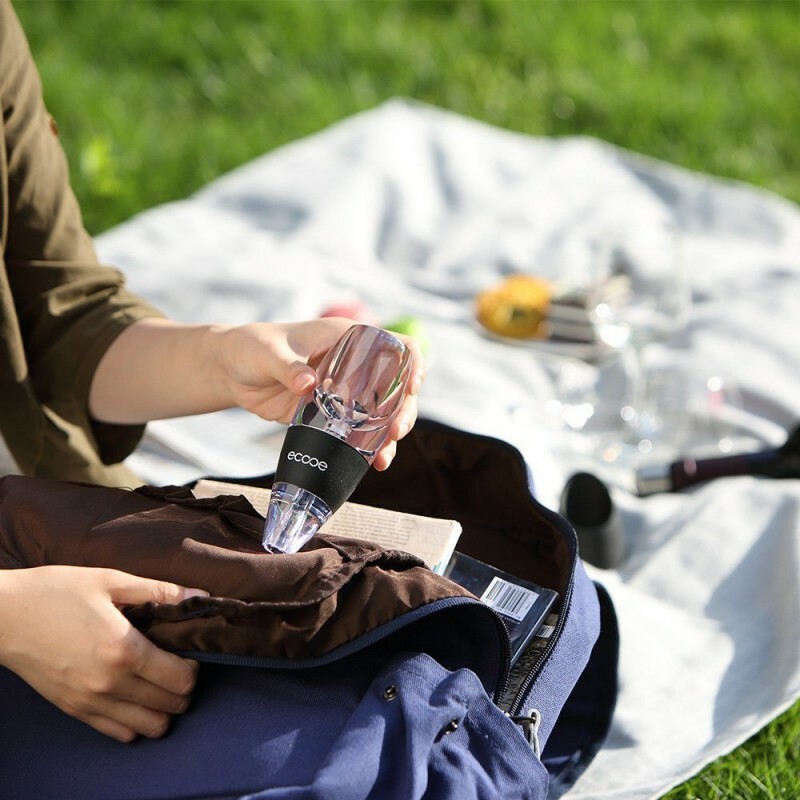 The mesh filter of the wine aerator makes the flow even, infusing a right amount of air into your wine. And thus bring out the enriched flavor and bouquet to the best. Just pour your wine through the wine aerator into your glass. 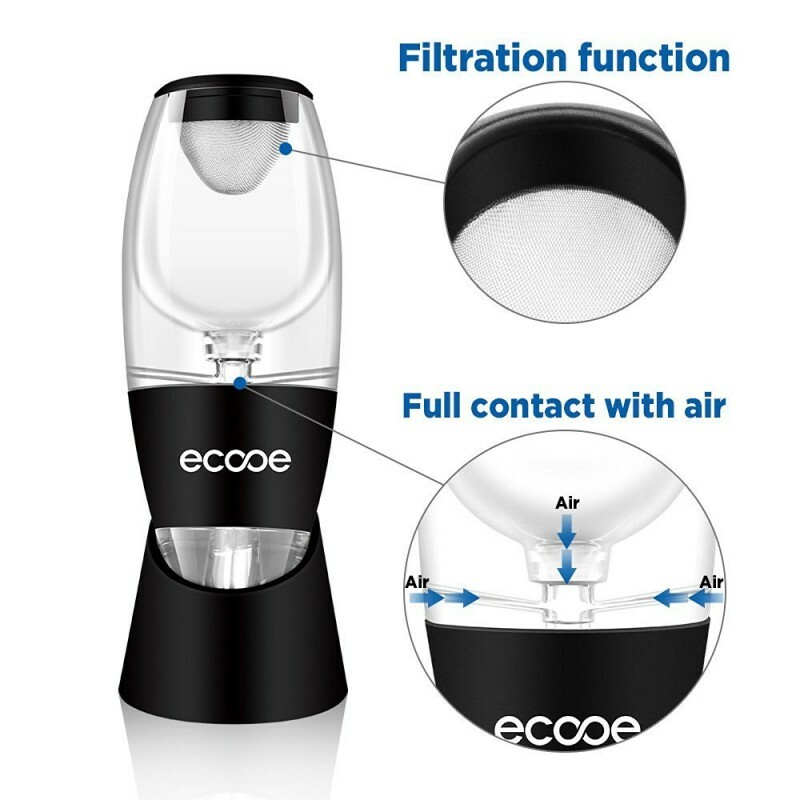 The wine will get enough air instantly in seconds, no need of time-consuming breathing like a traditional aerator. We choose heavy acrylic and a reinforced base, which are safe and durable to reuse for years. While the crystal clear wine aerator makes a great addition to your table. Convenient, helpful when you forget to uncork ahead of time. Convenient to use. Not as good as letting the wine breathe naturally, in my experience, but if you forget to uncork the wine ahead of time, this does make a positive difference. I bought this to add some flavor to cheaper wines that I buy. All you do is pour the wine through and it is aerated, adding flavor. It literally adds no time and is extremely easy to use. It's also very well built, with a combination of glass and rubber. Included is a mesh filter, a rubber stand, and a nice carrying pouch for easy traveling. I received this product for free in exchange for an honest review. Cheap little gadget that is a talking point at the table and IT WORKS! 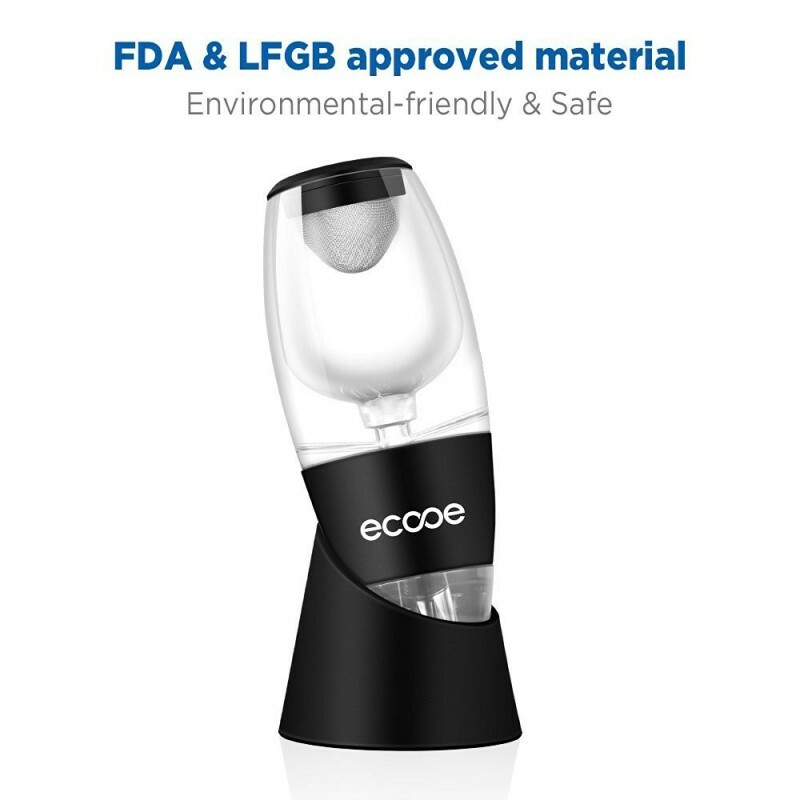 I have tested a few items of Ecooe and so far I am really impressed. So on to this rather cheap, but solid little gadget a Wine Aerator. I love wine do I class myself as a Wine expert? certainly not but if something relatively cheap is there to help improve the wines taste and smell then I am game! This little gadget is easy to use and simple to maintain. 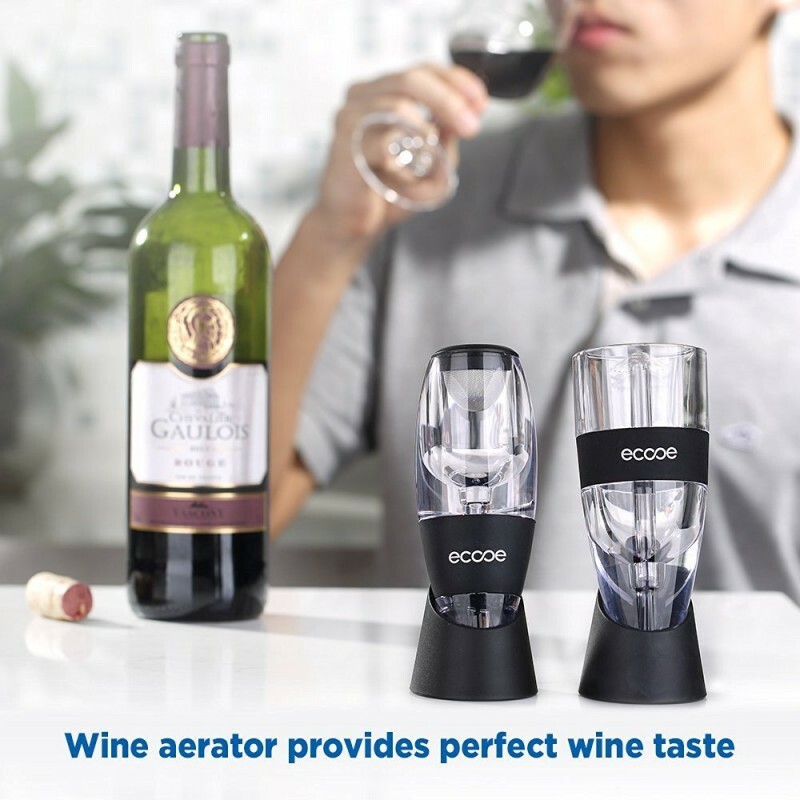 You literally hold the gadget above the glass you are filling and allow the wine to pour through the device in to the glass. As it does this the flow of wine is disturbed as it travels in to the glass with the help of gravity and air is passed through it. A clever design as no batteries are required and however gimmicky it sounds, IT WORKS! The build quality is solid, it feels sturdy and quick heavy. 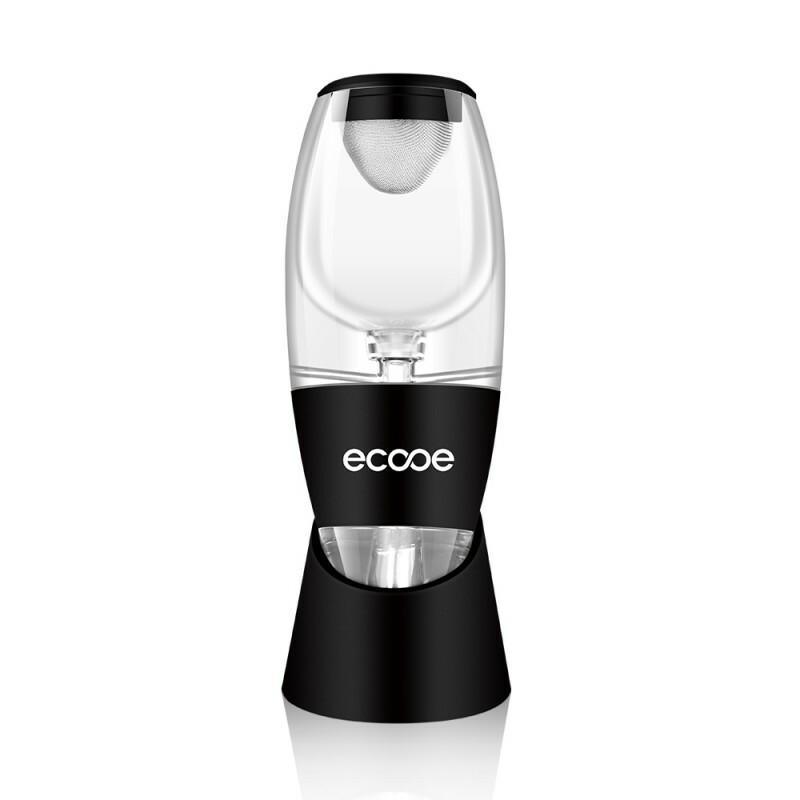 It comes with a small mesh cap insert at the top so should you cork the wine it will remove any whilst pouring. There is also a little stand so it can sit nicely in the kitchen next to my electronic bottle opener ready to go! You know what, for the price of a couple of coffees you could have a really smart gadget and I have bought a few for friends for stocking fillers! This is a really tidy piece of equipment which is ideal for wine drinkers. This contraption takes air out from the wine, its a matter of holding the wine airer above a glass and pour it into the glass, simple as that. It comes with the Wine Airer, Holder and a small Sieve. It looks good and it makes wine taste even better! I cannot fault this product and I would highly suggest this to any wine drinkers! 10/10 for the product and service provided. Thank you! It works! And what a difference it makes! A pretty remarkable little piece of kitchen kit. My sister had one of these in the USA and I was so impressed I decided to find one here in the UK. This did not disappoint. The build is good quality - it's got a nice weight and feels very sturdy. 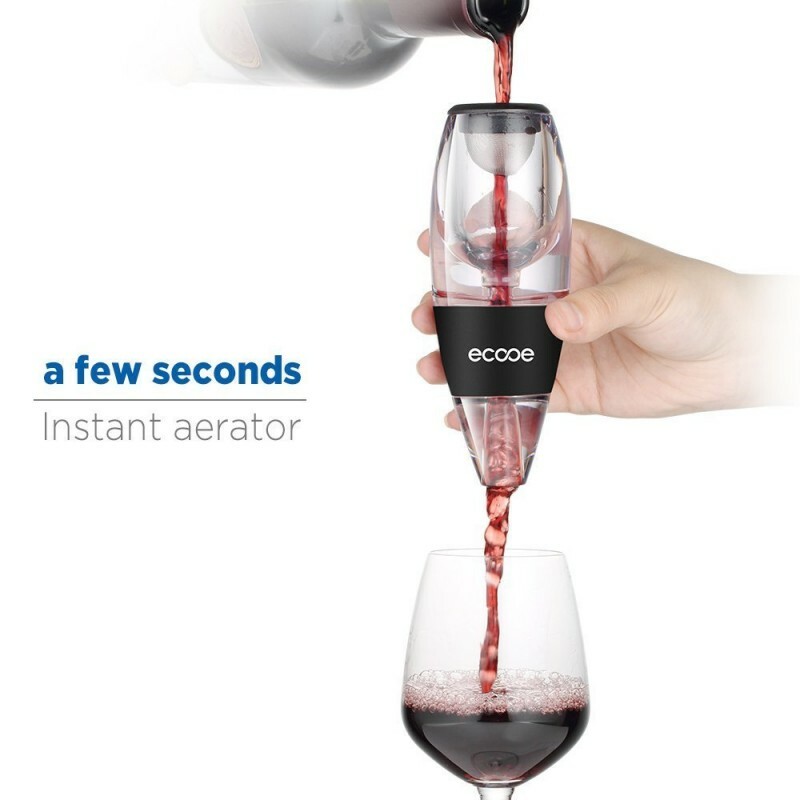 The instructions are clear and actually get you kind of excited about aerating wine! We tested this with both a merlot and a tawny port - the effect on each was remarkable, particularly the port, which we usually have to decant for hours to achieve the same flavour as the aerator produced in seconds. Easy to clean and I like the little travel pouch it comes with. Recommended! Usually, you need to allow wines to be exposed to air for an hour or two to open the flavor of the wine. I bought a bottle of wine to test this aerator. I poured it through, it made a weird bubbling noise, and filled my glass. I also poured another glass without the aerator for comparison. I tasted both glasses. The aerated one was delicious. The non-aerated one was dry and lacking of any flavor. If you drink wine, you need an aerator! This is such a good product. The build quality is nice and solid. The aerator is glass with rubber in all the right places. There is also an included stand for presentation. I am no wine connoisseur, I doubted I would be able to tell the difference between an aerated glass of wine and a normal glass/or a direct sip from the bottle. I was wrong! You can actually taste the difference, it makes the wine a lot easier to drink and brought out more of the flavours! It just tastes better! Genuinely impressed. Not to mention, the unit itself is very good quality. It is made of glass, so there is no effect on the taste. It has a nice silicon like grip to hold and prevent slipping. It comes with a little base that is also rubberized (The base is not as grippy so it can slide around a little). There is a little mesh filter that sits on top, I'm not sure what function this serves apart from preventing anything from falling into the aerator. The whole this is dishwasher safe too! It also comes with a nice little cloth carrying case that wont scratch or damage the aerator while travelling. I will be taking this with me when I fly home this summer to share this experience! Update: Turns out it is not made of glass, however it still feels extremely high quality and has not given any kind of a plasticy taste! Well, I'll be... this silly little thing actually works. How can you get the effect of decanted wine in the time it takes to pour a glass from a newly-opened bottle? After reading other reviews, I was convinced to try it, but after seeing it work I thought, "There's no way- that was too fast and too easy." I was wrong. I took 3 blind taste tests. I washed 2 identical glasses, opened a new bottle of Merlot, poured one straight from the bottle and poured the other through the Vinturi Aerator. I left the room and asked my wife to move the glasses to the table and call me when all the bubbles were gone. There was no question which one had been aerated. I picked it right away. Even when my son tried to tell me I picked wrong, I stood by my choice, it was that obvious. It softens the wine, releases the bouquet and created a silky finish. I took multiple tests and picked it right every time. My wife took turns testing and could tell as well. I got an aerator for red and white so a couple days later I opened a bottle of white and did the same test and got the same results. The difference is enough that I won't have a glass without it now. Even wine I would normally open and pour and drink right away is now aerated, red or white, it makes a real difference. I'm impressed and plan to show them off to my fellow wine enthusiasts at our annual New Years party.